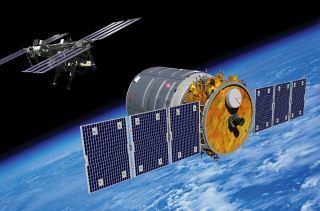 Artist's rendering of Cygnus spacecraft approaching the International Space Station. A new commercial U.S. spacecraft is set to make its first flight to the International Space Station this September, paving the way for regular cargo deliveries to the orbiting laboratory. The Dulles, Va.-based spaceflight company Orbital Sciences announced a planned launch window of between Sept. 14 and 19 to send its first cargo ship Cygnus spacecraft on a demonstration flight to the space station from NASA's Wallops Flight Facility in eastern Virginia. The mission will launch on Orbital Sciences' Antares rocket, which made its first test flight in April. In April, the company launched its Antares rocket in asuccessful debut flight at NASA's Wallops Flight Facility. Orbital initially had planned for its demonstration mission to take place earlier than mid-September, but the launch of NASA's Lunar Atmosphere and Dust Experiment Explorer, or Ladee, is first priority at Wallops. That lunar-orbiting spacecraft is set to investigate the moon's transient atmosphere and mysterious levitating dust particles. It has alaunch window of Sept. 6-10. But in case the Ladee mission encounters an unexpected delay, Orbital says it will be ready to launch Antares and Cygnus by late August. Cygnus has already been fueled and packed with about 1,300 lbs. (589 kg) of cargo, with another 250 pounds (113 kg) expected to be loaded later, the company says. As of now, Cygnus is scheduled to dock with the space station on Sept. 22. Orbital Sciences is one of two companies with NASA contracts for commercial cargo missions to the station. The other firm, Space Exploration Technologies, or SpaceX, of Hawthorne, Calif., has a $1.6 billion agreement with NASA for 12 unmanned cargo missions to the orbiting lab. NASA retired its space shuttle fleet in 2011, and the agency is now leaning on commercial companies to keep the space station fully stocked. Though NASA currently relies on Russian Soyuz vehicles to bring astronauts to the ISS, American firms like Orbital and SpaceX eventually are expected to take on crewed missions. Follow Megan Gannon on Twitter and Google+. Follow us @Spacedotcom Facebook or Google+. Originally published on SPACE.com.